Yup, it's a coral snake. We tried to chase it into the lower field of the good house, but we lost it about ten feet from the edge of the bluff. It would make a beautiful necklace. You always have to put safety above everything, including aesthetics. I know who you are. I put the cut in to protect you. Why did you peek? If you mean me, that wasn't! Really!! Oh goody...U can haz coralsnake. I'm torn between wishing it wasn't there and being totally psyched that I have a coral snake. In its favor is that it's quite non-aggressive. There were three of us chasing it and all it wanted to do was to get away. Only one of the photos was in focus. I need to get the autofocus fixed on my camera, this is where it comes in handy. (Note to all: In case you didn't know it, hitting your camera with a pick axe is bad for the autofocus.) In addition, I had my new video camera with me and there was a person on the sidelines to hand it to, but I never thought of getting it out. It's too bad I didn't. It would have made a great video. I love my snake boots. There's something exciting/attractive about having a critter on your land that can kill you--that adrenalin rush thing. OTOH, then you have to be careful *every time*. At least coral snakes are beautiful. No amount of aesthetic adjustment makes a western diamondback rattlesnake beautiful. I'd rather have a bobcat or a mountain lion. But--what you see is what you get, and you got a pretty. ooh! beautiful! That's a big one! It's rough to have a sister who only likes the idea of venomous snakes, not the reality. 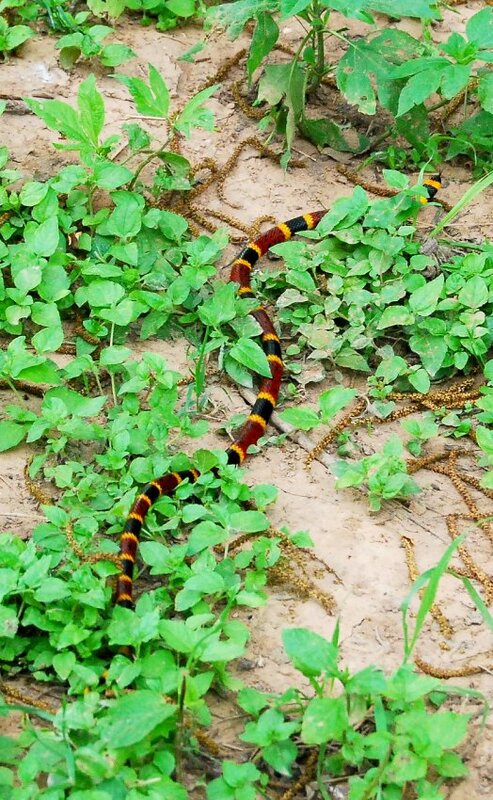 Didn't someone out there tell me there were no coral snakes in tx? Probably Tom. I have not forgotten. 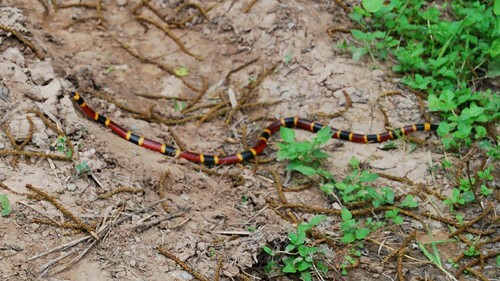 A kid at FIT was tapped on the ankle by a tiny coral snake, His friends threw him in the car and sped to the hospital. By the time they got there, probably about 5-10 minutes, the kid could no longer speak and was having a hard time breathing, He survived and recovered but there is no fooling around with these things. Get G some boots and mow a nice wide path so no one, and no thing, surprises anyone or anything. Like, just to take a random example, me.